From pancakes to soups, wheat flour has definitely earned its place in our kitchens. But food processing has deprived this culinary essential of nutritional value. Enter cricket flour—it’s packed full of protein, calcium, iron, and B12. Oregon based Cricket Flours is one of several emerging companies that are capitalizing on the nutritional and not to mention, environmental benefits derived from consuming insects. Insects are fast becoming an important food source. Even the United Nations, through its Food and Agriculture Organization, has considered and extensively explored the future prospects for so-called edible insects, especially in addressing daunting issues concerning food and feed security, as well as farmland limitations. Cricket Flours chief executive Charles Wilson and chief operating officer Omar Ellis are banking on the aforementioned UN report to promote and justify their flagship product—cricket flour. Made from ground crickets, the product is positioned as a healthier and sustainable substitute for wheat flour. Essentially, Cricket Flours sources out crickets raised in the United States and process them into versatile flours. The company has its own ethical guidelines to ensure they kill the crickets in a humane manner—either with carbon dioxide or through temperature alteration. The actual processing is straightforward. After selecting and killing the crickets, they are then sorted, cleaned, and then baked, dehydrated or freeze-dried to remove moisture before milling them into a fine grain flour. Despite the seeming unconventional origin of the product, Wilson and Ellis maintain that cricket flour will be appealing to several groups of people. For instance, athletes and bodybuilders would find their product as a good and alternative source of high-quality protein. Individuals with diet-restrictions, especially those who are diabetic or allergic to gluten would definitely find cricket flour as a healthier and safer alternative to wheat flour. The product also intends to appeal to individuals who advocate for sustainability and environmental conservation. “Crickets are more efficient at converting resources into protein, and are actually 20x more efficient than cattle at creating protein gram-per-gram. 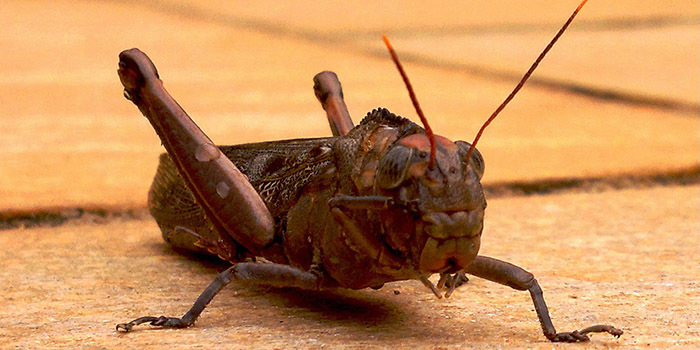 Because crickets are cold-blooded and can be raised using less land resources, they require only a fraction of the same feed and water required from other protein sources such as cattle, poultry, and fish,” said Ellis. Currently, Cricket Flours is looking for more venues to market its product. The company has also launched its own cookbook that features different recipes using cricket flours—from muffins and smoothies, to cakes and sauces.